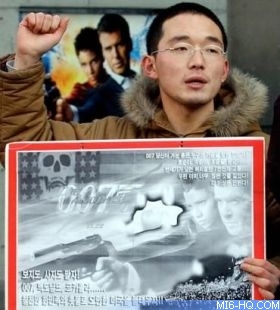 The release of "Die Another Day" in Korea sparked huge protests from both sides of the border. Korea Protests Against "Die Another Day"
"Die Another Day" features a renegade North Korean villain, Colonel Moon, hell bent on taking over the South by means of a military invasion over the Demilitarised Zone (DMZ) after Icarus has cleared their path across the minefield. The film was bound to cause a stir in the region, but nobody could predict the strength of the protests. 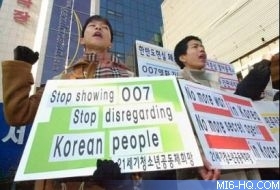 Both North and South Korea found reasons to launch boycotts against Bond's latest adventure. 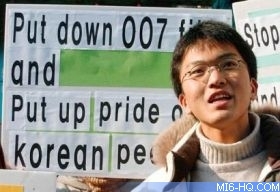 North Korea were voicing their distaste at 007's latest mission even before the film had entered production. The Korea Federation of University Student Councils issued a statement in December 2001 calling for production to be cancelled. Shortly before DAD opened in Korea, a 20th Century Fox Korea spokesmen anticipated the ill feeling towards the films and said "There are some misunderstandings of the movie. The enemy described in the movie is extreme nationalists, not North Korea". But Lee Tamahori poured fuel on the fire by saying "To hell with North Korea. It's a basket-case country and the sooner its leaders all roll over and die, the better." In an interview just as protests in North Korea were reaching their peak. Above: A South Korean student shouts slogans during a rally to protest. This caused the Secretariat of the Committee for the "Peaceful Reunification of the Fatherland" to issue a statement calling for the US to stop to screenings of DAD in North Korea and called is a "dirty and cursed burlesque aimed to slander North Korea and insult the Korean nation". The statement, issued to the Korean Central News Agency, went on to say "The movie describes the Democratic People's Republic of North Korea as part of an 'axis of evil', inciting inter-Korean confrontation, groundlessly despising and insulting the Korean nation and malignantly desecrating even religion". Korean-American actor Rick Yune, who plays Zao in "Die Another Day", tried to quell the controversy by saying "The enemy in the movie is not North Korea, but the individual he plays". He also went on to say that "The movie has nothing to do with Bush's characterisation of North Korea in January 2001 as part of an 'axis of evil' because the story was written four years ago". Meanwhile in South Korea - where the film opened later than North Korea - physical protests against the film were more prevalent as protesters surrounded cinemas in Seoul waving banners and causing mayhem for people wanting to see the film on New Years Eve. The reasons for protest against DAD in South Korea were not the same as the North. A national boycott was attempted on the grounds that the film depicted South Korea as a US Colony, and activists claimed boycotting the film was necessary inorder to protect national pride. The US keeps 37,000 troops in South Korea after the Korean war of 1950-1953. 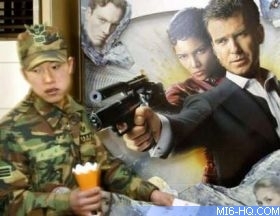 Above: A South Korean soldier walks past an advertisement at the premiere in Seoul on New Year's Eve. Further controversy arose when South Korean Buddhists discovered Bond and Jinx make love in a Buddhist temple at the end of the film. The Jogye, South Korea's largest Buddhist order, issued a statement saying "This is a slight to Buddhism, which has purified the culture and mind of mankind for 2,700 years". The order went on to say the film was "distorting warming ties between South and North Korea and inciting conflict". Buddhism is the biggest religion in South Korea, with about 12 million followers among the 46 million population. Above: South Korean high school students shout a slogan during a rally in Seoul. Above: Another student at the Seoul demonstrations. A cinema outside if Seoul finally bowed to pressure and cancelled all showings of "Die Another Day" after less than a week of release in the country. Despite the protests (infact some cinema goers said they were going because of all the media attention) "Die Another Day" opened well in both North and South Korea, but takings were down to approximately 65% of the level achieved by "The World Is Not Enough". South Korea is Fox International's 10th highest grossing territory.